Enspert has announced the launch of its 7-inch tablet PC, IDENTITY TAB, in South Korea on KT's networks. 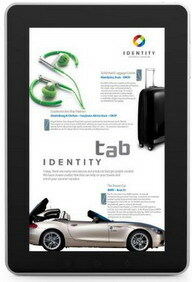 IDENTITY TAB is a 7" Android based tablet PC. IDENTITY TAB's (i-tab) powerful hardware includes a capacitive multi-touch LCD, a 1GHz CPU, 8GB of embedded memory, a DMB chip (for television viewing), a light sensor, a GPS chip, an accelerometer, and a 3.0 MP camera. Pre-installed applications include an e-Book viewer, MS Office (for document viewing & editing), and AR. Popular social media applications such as Twitter, MeToday, and Facebook are also pre-installed for convenient SNS usage. The Android Market is available for more applications, such as navigation applications. A special DLNA (Digital Living Network Alliance) based 3 screen solution is embedded on the IDENTITY TAB to enable seamless content sharing between a TV, a PC/Laptop, and a mobile phone. It will also come with a personalized delivery service, sampling and scanning the user's profile, interests, and propensities to find and deliver recommended content via intelligent push solution (Dynamic Contents Delivery). The press release notes that Enspert's product will not only be launched in the domestic market, but will also be launched in North America, Europe and China. Enspert is actively engaging with partnerships among regional and global entities. 0 comments on "Enspert IDENTITY TAB is an Android-powered 7-inch tablet"